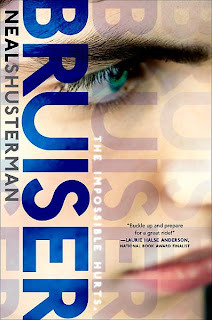 I've read some of Shusterman's other books and they was absolutely amazing (Unwind gave me chills). Bruiser was no exception. It was a super easy that I finished in a mere three hours. Told from different points of view, we get the whole story on out Brewster, a strange boy who doesn't have many friends for a very good reason. Unlike Unwind, it was told in a more present day setting and very relate able for regular high schoolers. They go to a normal school and know normal people with the exception of the one boy. Bronte and Tennyson, a set of twin who, more often than not fight, similar to your average siblings. Although, they share more than genetics. Brewster, Bronte's social experiment turned boyfriend is also one of Tennyson's best friends. The character dynamics are strong and really interesting to read about. They're serious and amusing all at the same time. What I loved was the fact that everything that happened in the booked seemed like it would've really turned out that way if it happened in real life. It's was overly predictable or complete off, but just right. The chapter title were also something I definitely looked forward too. Because Bronte and Tennyson are the children of English professors, each chapter is named about a word that is used in it. Needless to say, my vocabulary grew. Eventually, when you get enough into the book really feel sympathy for these characters. Brewster has to deal with so much and his POVs show this. When ever you read his poem-like chapters it really hits your chords and allows you to see what kind of chaos he has to live in. His struggles trying to balance his dooming friendships, his uncle, his little brother Cody (who, by the way, has amazing chapters as well), and his girlfriend. All in all, there really wasn't much I didn't like about this book. It was kind of short and I would've loved to read more, but what's there now tells the story very well. So believe me when I say that this book totally worth the read.